Ever one to have to take a screwdriver to something cheap to see how they have done it I have done it again this time to a GY560 frequency counter. The factory is kicking these out at 1000+ units a month apparently. - Frequency step : 200K (digital radio signal), 1K, 100Hz. - Testing distance : UHF : 8m, VHF : 5m. - Operation : the only one button with all functions. And I can confirm with playing it really does work 50MHz to 2.4HGz. It sort of scans constantly (once turned on) until there is a strong signal, locks on and shows the frequency and the signal strength. It auto shuts down after about 60 secs if nothing happens. The uPC inside is an AVR Atmega8, they tried to hide that by a sticker but yu can still 'just' read the codes. Some of the smd IC are pretty standard and I found a 74HC00, 74HC393 both seem to be performing a divide/count function maybe? an LM358. Some are a little rarer MB506 High frequency pre-scalr, uPC 1667G which I have no idea what it is maybe a pre-amp of some sort maybe? There is a A 7805 regulator, 4 discrete diodes, an inductor, electrolytic and a resistor, there is a nice little compact 2x8 LCD too, a 4MHz crystal, small trimmer capacitor and a handful of C and R SMD of course. I managed to keep it working at 8V (I connected a variable supply to it.). I'd say it operates more like a VHF/UHF field strength meter than a frequency counter, did pick up signals from my WiFi, 6m, 4m, 2m and 70cm. 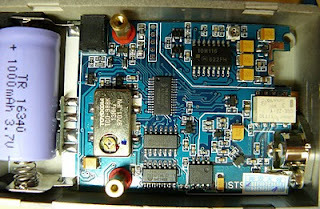 Also a car remote 433MHz and remote door bell 434MHz. This was the household telephone. The case comes off, 4 screws, the PCB is hld in place with 4 motherboard riser type hex stand offs that the other 4 screws attach to, the switch is a tiny push to make, and there is a PP3 battery connector and a tiny little whip antenna. For £7.20 and £5.50 Post bargain really. I found this schematic which seems to match up with my probing about. The guts of the Yaege FC1, that Paul (see comments) asked about, note the 3.7V 1000mAH battery, you use a mini B USB cable to recharge it!Don't do that from the laptop !!! The specification manual from mine. Again both of these are really field strength meters not frequency counters. You 'could' add a tunable front end band pass filter. It won't work for HF bands, right? 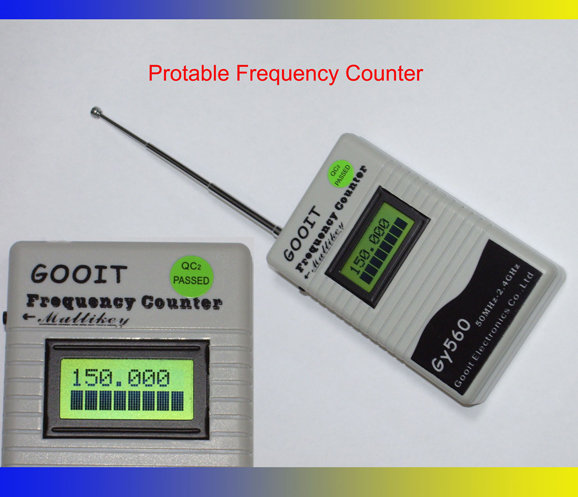 There is also a $40 requency counter on Ebay which claims to read 10Hz - 2.6GHz. Have you tested / considered that one? Nice, though I think my Yaege FC-1 which has an HF range as well is better. Its TCXO holds calibration very well, too. No I didn't see it work on HF... I might tinker though but it didn't report anything lower than 50MHz. Paul, It wasn't a case of trying it over something else was just for the price was so cheap. I can see it might make a useful VHF/UHF field strength meter. Yes the http://www.ebay.co.uk/itm/YAEGE-FC-1-Portable-Frequency-Counter-10Hz-2-6GHz-NEW-/130506470215 seems a bargain too but is 3 times as much (about 33GBP with shipping costs). The TXCO included isn't bad. I have an image of one I'll add to this blog post. I suspect the minimum frequency is imposed the short aerial and upc1667 pre-amp. It may be worthwhile to try connecting the signal source directly to the MB506 prescaler's input. My counter arrived today. Connecting a sig-gen to the counter's telescopic aerial via a crocodile clip allowed operation below 50MHz. In this URL, the display is showing 7.000MHz. I could not get anything below 50MHz on mine to make any difference. I just got myself one of these counters and I like it, but I found that the battery life is way too short, even when using an Energizer battery. I have hard wired the counter to a 9v supply to covert this handheld counter into a desktop counter. The only thing left to do is disable the auto power-off feature. Does anyone have a dump of the code from the Atmel? 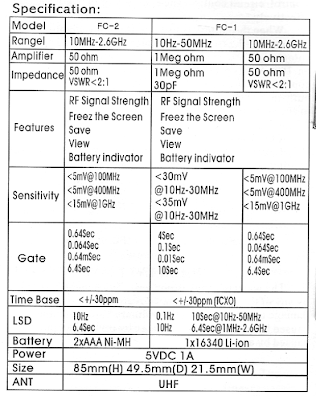 @Clig, the auto power off is disabled in the 200kHz step mode. Unfortunately the 200kHz mode may not be useful as a benchtop counter because it expects a pulsed signal (e.g. digital transmission) rather than a continuous one. I plan to fool the counter into thinking every signal is a burst by holding the controller pin1 (reset) to high. Ok, let me know if that works. Is it 5v that I should send to the reset pin? or 3v? Why do you say "Again both of these are really field strength meters not frequency counters. ", what would be the difference between this tool and a frequency counter? Anything related to the triggering level? 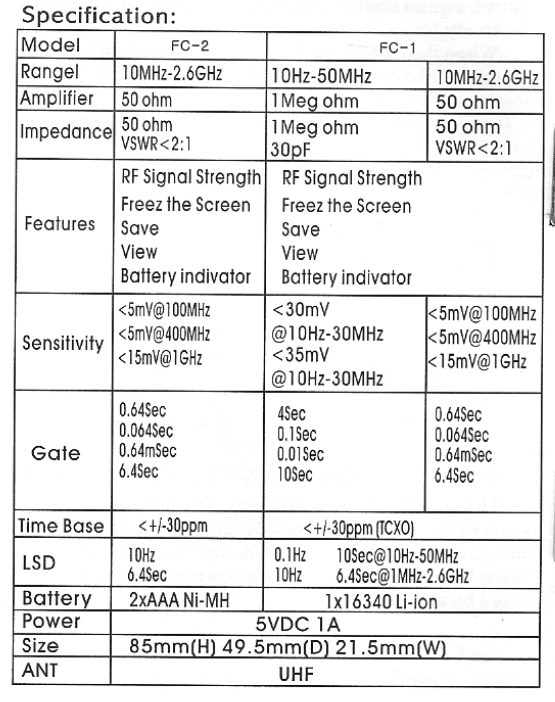 I personally don't think it's anything like a field test meter as field test meters display output electromagnetic strength in milliwatts (dbm) of the transmitter where as a frequency counter will count the cycles per second and calculate the frequency (which the gy560 dose) and are two completely different forms of measurement.